So I’ve been knee-deep in kitchen decluttering and spring cleaning these past two weeks (right there in the trenches with you guys who are participating in this month’s kitchen organization challenge as part of this year’s Organize & Refine Your Home Challenge). 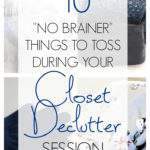 I know that it can be tough to get started when it comes to the decluttering process. 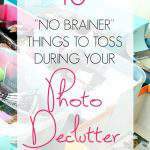 When you’re having trouble, my best advice is to start with the low-hanging fruit so to speak…the “no brainer” items. 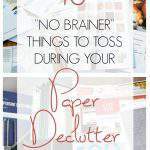 As I went through my most recent kitchen declutter, I compiled a list of 10 “No Brainers” that you can immediately place into the “toss” pile. In EVERY kitchen I’ve organized during my time as a professional organizer, there was always a kitchen cupboard that was overflowing with coffee mugs. Always. Many times, the homeowners didn’t even drink coffee or tea. I’d go as far as to deem it the #2 most common kitchen clutter culprit (second only to paper clutter). 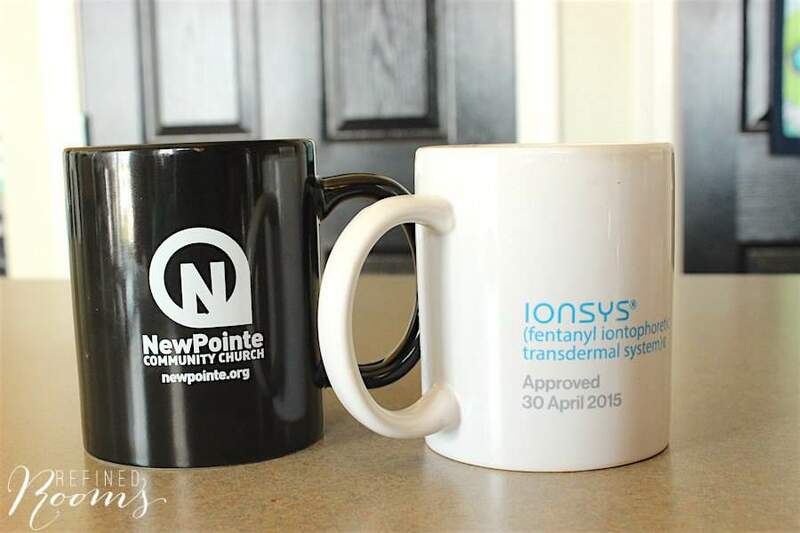 Everyone can benefit from decluttering their mug collection. Of course, keep your favorites (like the ones that your child gave your for Mother’s Day), but the random giveaway mugs should go for sure. What items will you be tossing from the list? What else would you add? Share with the rest of us one of the items that's getting put in your toss pile? 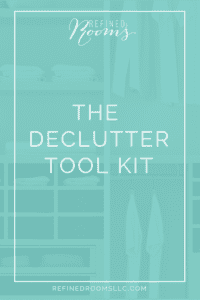 Need some additional decluttering help? O.M.Word. i have everything except for the waffle maker! guess what i’ll be doing today!!!!! GREAT ARTICLE!!!! LOL! Join the club Stef! If all that sounds like you, it’s time to start purging. 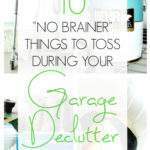 Here are 10 no-brainer items to begin tossing so you can proudly open those garage doors. Years ago I had several vases I did not use. Took about a dozen very clean ones to the florist and she gave me a bouquet of flowers for my efforts. Was nice to know they didn’t go in a land fill and went to use for others. That last item is a mandolin and yes, it is for slicing veggies. The separate piece is used to push the veggies back and forth over the blade so as not to gnaw off your skin! It’s handy but if you don’t use it, then it should go. I just cleaned out old plastic straws and odd cup tops that didn’t match anything this past weekend. It wasn’t a lot of items but it sure felt good! It is AMAZING how good it feels to purge Suzanne! Oh — I think you must have been in my kitchen! Great post. I need to purge and de-clutter so much of my old stuff. Thanks for the inspiration. I love this post! 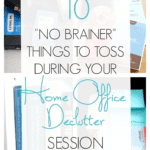 I am organizationally challenged, and I have tossed a number of things on your list. But there is always more to be done! So funny, the mystery tool haha,ha! I think we all have one of those lurking in our cabinets somewhere. I am tossing my grandmothers silver, the asparagus server just isn’t getting used anymore! Oh my. I don’t even know what an asparagus server is! Yes, it can be pretty humorous to see what we dig up when it comes time to empty out those drawers and cabinets. We have been in our house for 10 years and I am constantly decluttering. I had a cabinet over my microwave that I kept vases in from a party I gave and needed a bunch for centerpieces. I cleaned out the cabinet tonight (about 4 hours) before seeing your post on Pinterest. My cabinet was full and looked just like your cabinet. I also had the stash of souvenir cups and coffee mugs as well as my husband not wanting to let go of either. Last year I cleaned out our coffee cups and bought 8 that matched. It is nice to be able to stack them but I still have more unmatched coffee mugs than I want to see in the cabinet that are “special”. Thanks for sharing! LOL Tara! The irony of stumbling upon this post on the same evening you chose to clear out that cabinet. Just goes to show you that great minds think alike! Great tips! We always seem to collect unwanted coffee cups. I usually give away a box load every two years. Thanks for sharing at Merry Monday. Love the addition of strange items and things covered in dust. I have a few of those hanging out in my kitchen, I’m sure. Purging makes me happy, although my husband isn’t quite so quick to want to get rid of things! Thank you for linking up with Funtastic Friday! Purging makes me happy too Victoria! Great tips. I am packing our house and I have boxes of stuff to get rid of and also a box of stuff for kids and friends to look through to see if they need any of it. Vases are always a problem. Lucky for me, one of my friends is looking for vases, so they will go to a new home. Thanks for linking up to Tips and Tricks. Hope to see you again this week. That’s perfect Kathleen! Good luck with your move and thanks for stopping by! Sensible AND funny – a perfect mix! I have a similar thing to your last mystery item, like your other commenter said, it slices veggies, you can do onion cubes or carrot sticks in it super quick. I do actually use mine so it’s staying, but the 10 or so vases and yucky pot holders have to go. I love the dust layer rule – makes sense too. I got rid of a lot of dusty things when we moved house last year but I feel another sweep could be necessary following the “have I used it since I moved” rule. This is an amazing post. I literally forgot about all of these things and I have ALL of them sitting in my kitchen right now. I’m tweeting, pinning and stumbling this post. And when I get home tonight I’m GETTING RID OF THEM FOR GOOD. Happy Tuesday! Oh Lindsey, this made me smile! It will feel AWESOME when you get rid of those “no brainers”. I promise! It looks like the last thing on your list is a vegetable slicer – like, you stick the potato or whatever to the round part, rub it over the flat part and it makes nice little fries. Maybe. We’re in the middle of doing the great kitchen clean out (some people call it nesting, but I call it wanting to declutter the kitchen before I never get more than 3 hours of sleep at a time again!). Luckily I have older kids that I can get to help me. Oh Jenny, thanks for unraveling the mystery! I suspect you are right! Thanks but I’ll just stick to knives if I need to slice a veggie (or throw it in the food processor). Congrats on your impending bundle of joy…and yes, I was the the same way when I was nesting. Thank goodness for the older sibs! Yes to all of these!! We had a ton of mugs despite the fact that no one in our house even drinks hot beverages with any regularity. How did we get a cabinet full of mugs?! We got rid of a bunch and haven’t missed them since. Great list! The funny thing is Emily, I’ve never once missed anything that I’ve let go of during a decluttering session (and certainly not my excess coffee mugs). Glad you liked the list! Love this list! YES to the vases… I wrote a whole post once about my own personal struggle with a very large vase. I ended up taking it back to the florist, who was thrilled to receive it. And souvenir cups? Boy does I come across a lot of those…. Well I never thought about returning them to the florist. What a novel idea Seana! Of course, after I published the post, I reallized that I omitted another biggie…the collection of sippy cups from years past. Am I right Seana? Great post Natalie, I laughed when you mentioned the excess mugs and souvenir cups, 2 things that my husband has trouble letting go off. Isn’t it interesting how similar we all are with the things in our kitchen we hold on to.